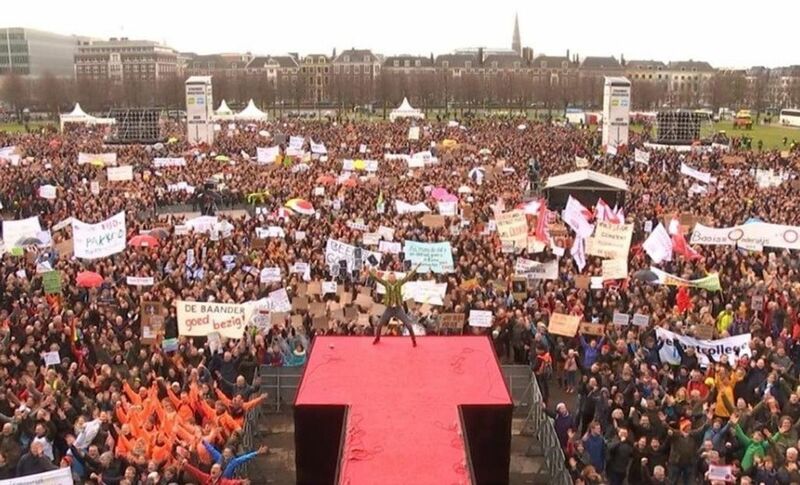 This 15 March 2019 video is about the big striking teachers’ rally on the Malieveld in The Hague in the Netherlands. More than 100,000 primary school educators joined a nation-wide strike in the Netherlands on Friday, March 15, closing more than 2,600 primary and several middle schools across the country. Some 40,000 teachers and support staff travelled to The Hague, where the Dutch parliament sits, to protest horrendous conditions in schools, low wages and high workload caused by years of austerity carried out by all the major parties. The determination among educators to fight is part of a wave of teachers’ strikes spanning five continents and a rise in working class struggle around the world. There is a growing opposition after more than a decade of deep cuts to education budgets and other areas of social spending … . In many cases educational spending has not returned to levels seen prior to the global financial crash of 2008 even as endless resources are spent to re-inflate the stock markets, military spending is massively increased and social inequality continues to rise. The past year has seen strikes by educators across the US, in West Virginia, California, Colorado, Illinois, Kentucky and Indiana, involving over 450,000 teachers, the largest number in decades. In Latin America, teachers have struck in Brazil, Mexico and Argentina to protest against pension cuts and “school reform”. In Europe, teachers in Germany held a protest march in Berlin last month, Portuguese teachers joined a general strike and “Red Pen” teachers organized on Facebook in France supported “Yellow Vest” protesters against Emmanuel Macron. In Africa, teachers have struck in Morocco, Algeria, Tunisia and Zimbabwe, against declining education budgets and school privatization. Indian teachers as well as teachers in Iran and Israel struck against poverty wages, in the face of state repression. A recent nation-wide survey of 10,000 teachers in the Netherlands gave an indication of the conditions that have pushed them to the breaking point. They reported going to work while sick, described training one temporary teacher after another, and said they could not provide the individual attention and guidance pupils require. More than 80 percent of primary schools report a lack of substitute teachers, with 20 to 29 percent of job vacancies unfilled in 2018 (see: “ Lack of teachers, work overload undermine Dutch education system ”). Indeed, on the day of the strike, news emerged of a primary school in the university city of Leiden forced to close its “Group 8” class, the highest class before students advance to middle-school, because there was no teacher for them. This is one of many such cases. Often children are transferred to other schools, increasing their class sizes and workload, or are put back down one class lower. Other schools have resorted to a four-day school week. During the demonstration at The Hague, teachers gave short speeches and shared their own experiences, which painted a devastating picture of school conditions. According to the AOb’s own figures some four billion euros are required in additional funding for education. However, the coalition government headed by Mark Rutte of the People’s Party for Freedom and Democracy has proposed an increase of just 270 million euros in this year’s budget. Slob proposed to increase the annual budget per school by the paltry amount of 50,000 euros, up from the previously agreed 35,000 euros. This increase, assuming it actually materializes, would do nothing to resolve the crisis of staffing in most schools. In fact, the funding increase is being promised over the four-year budget and may never arrive. There is immense anger against these conditions. … Teachers should form workplace action committees in every school to outline the demands for what they and their students need, not what the government … says is affordable. These committees should organize a real struggle and appeal for the broadest support from students, parents and the working class. The fight by teachers against austerity places them in direct conflict with the entire political establishment, both the right-wing Rutte government and the Labour Party [PvdA; the junior partners in Rutte’s previous cabinet], and their allies in the trade unions. The PvdA’s record of cuts saw it punished by workers in the last elections, with its vote collapsing from 25 to 6 percent. The entire political establishment declares that there is “no money” for schools, hospitals and social services, while the Dutch military saw its funding increased by 1.5 billion euros in the last budget. The government has pledged to meet the NATO-demanded military spending of 2 percent of GDP in coming years. The fight against austerity and militarism being pursued by the European Union and capitalist governments around the world requires the fight for socialism and the taking of political power by the working class. Only in this way can the economy be reorganized according to social need, rather than private profit, and tens of billions poured into education, healthcare and other social services. This entry was posted in Economic, social, trade union, etc., Human rights and tagged education by petrel41. Bookmark the permalink.